Kas Tribon is our holiday home in Curaçao. It is located in Villa Park Fontein, in ‘Banda Abou’ which is a quiet part of the island surrounded by nature. Some of the most beautiful beaches like Cas Abou, Porto Marie and Daaibooi are in close proximity. 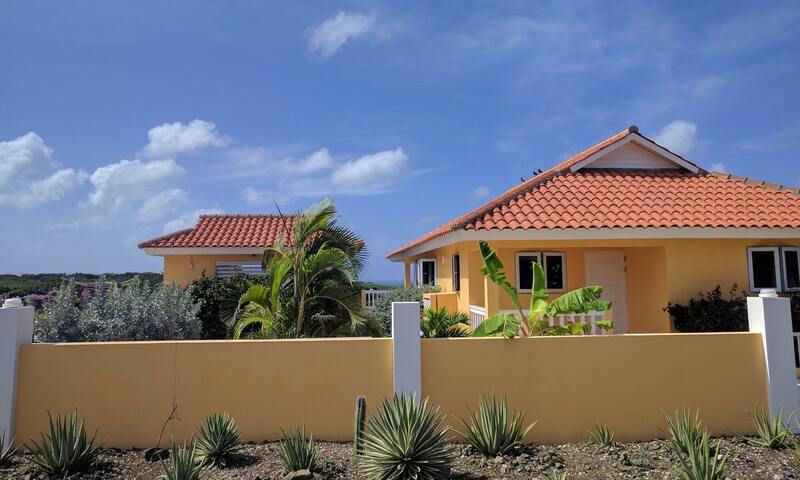 With 3 bedrooms, 3 bathrooms and its own swimming pool, the house is completely furnished to provide accommodation for a maximum of 6 persons. The terrace and the swimming pool provide a panoramic view of the hills and you can see the Caribbean Sea on the horizon. It is our aim to provide as much information as possible of the property, facilities and amenities on the island via this website. Life on Curaçao is mostly outdoors and this is an extra bonus when staying at Kas Tribon. The villa is located on a large completely fenced off plot on a hillside. The villa is surrounded by beautiful gardens, showing off an abundance of tropical vegetation and offers parking facilities for 2 cars. The spacious terrace offers various shaded / under cover seating areas and of course a swimming pool. The whole of the terrace offers an unobstructed view of the beautiful green hills and the Caribbean Sea and day after day you can enjoy the beautiful sunset! The plot directly in front of Kas Tribon also belongs to us, so the beautiful views remain unobstructed, as shown on the photos in this website! Kas Tribon caters for a stay of maximum 6 persons. There is always a refreshing breeze in and around the house due to its hillside location and the prevailing wind. There are 3 bedroom : a master bedroom with en-suite, a spacious bedroom at the front of the house, a second bathroom and a slightly smaller bedroom. The kitchen is fully equipped with all the necessary mods and cons. If you decide, after having seen this website, that you would like to stay at Kas Tribon. We let our villa during the periods that we are not there and you can contact us direct to enquire about a booking. Click through for reservations, prices and availability. Curaçao is a fantastic island where the weather is always beautiful! All year long the temperature is between 27 and 33 deg. C and there is always a refreshing breeze. Amongst divers Curaçao is renowned for its coral reefs which can easily be reached from the beaches. For beachgoers there is also plenty of choice from quiet tranquil beaches to fully service ones, so catering for all. The natural beauty of this island is worthwhile exploring and there are various nature walks in the nearby proximity of Kas Tribon.